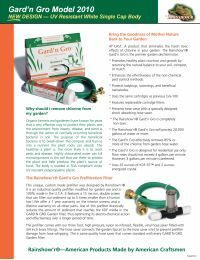 The Rainshow'r GG-2010 Gard'n Gro Dechlorinator promotes healthy plant nutrition and growth by reducing the harsh toxic effect of chlorine and returning the natural balance to your soil, compost or mulch. Pets: The Gard'n Gro is also a healthy alternative for bathing your pets, whose coats can become brittle and their skin dry and flaky when exposed to chlorine. Cars: Automobile enthusiasts will find their wash & wax jobs last far longer when cars are washed with dechlorinated water. The Gard’n Gro’s filtration media effectively removes chlorine from your water. Note: The Gard'n Gro is specially designed for the garden, not as a drinking water filter. Its filtration media effectively removes chlorine from your garden water, but it is not designed to remove particulate matter or other water contaminants. WARNING: The Gard’n Gro and the Green Knight are designed for garden and hydroponic use, not as a drinking water filter. They are not designed to remove particulate matter or other contaminants such as organic chemicals from drinking water. Please also note that these filtration systems are not recommended for use in filling fish ponds.